Airy and sunny one bedroom apartment, central location close to Boulevard de La Croisette. If you have been looking for a large studio apartment in a central location you can stop looking – this is the apartment for you. If you are looking for a one bedroom apartment, you can also stop looking. This beautiful, newly refurbished apartment consists of two rooms with a sliding wall between the bedroom and living room. This smoothly slides across to enable use as a large studio or as a one bedroom apartment. So it is something of a mix between studio and two-room apartment, with the best of both worlds. Well-designed with large windows giving tons of natural light there is a feeling of space and harmony. Exit to the balcony from both living room and bedroom for alfresco dining. Bathroom with bath/shower/toilet, separate guest WC. Fully equipped kitchen with Oven, hob, microwave, Nespresso, fridge/freezer, dishwasher, washing machine, etc. Bedroom with two comfortable single beds and in the living room there is a very comfortable sofa that easily converts into a full size double bed. New air conditioning system, Smart TV, Apple TV, Wi-Fi, Bluetooth sound system and DVD library. All equipment and furnishings are to the highest standards ensuring that your stay will be very comfortable. A great apartment to enjoy your holiday or congress week in Cannes. 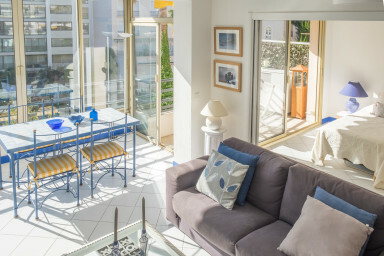 The apartment is very centrally located in a newly refurbished building on Rue Rouaze, parallel to the Croisette, just behind the Carlton and Martinez Hotels. Only 1 minute from the beach and 10 minutes from the Palais des Festivals, this is an ideal location for both holiday and congress. The location is quiet and yet close to Restaurants, Shopping, Rue d’Antibes and the nightlife of the Carré d’Or district. Car parking is available in the street or for free just 100 m away so you can simply forget the car and enjoy the delights of Cannes by foot. Everything fine in this appt. Glimrende beliggende leilighet, med 2 min. til både strand og shopping. Praktisk med 2 toaletter, og deilig veranda med ettermiddagssol. Bare 5 minutter unna ligger det store supermarked hvor man kan handle inn. Supert sted!! Everything ok in this Appartement. Anders organizes everything. We wore very pleased with both the location and the standard of the apartment. If to pick on something, a couple of extra towels would be great.